Norway’s national parliamentary election is less than six weeks away, but only now are politicians returning from their summer holidays and getting into campaign mode. Many voters seem to assume that Norway’s non-socialist parties will win this time, leading to worries that voter turnout may be low. Public opinion polls have for months showed the non-socialist (borgerlig) parties in the lead, with the Conservatives (Høyre) keen to head a coalition government that’s likely, for the first time, to include the even more conservative Progress Party (Fremskrittspartiet, Frp). A recent study by three researchers at statistics firm Norsk Regnesentral indicated there’s a 91.5 percent probability for a Høyre-Frp majority, and less than a 5 percent chance that Norway’s current left-center government coalition led by Labour will win a third term. Despite the polls and prognoses that Høyre and Frp look set to win a majority in Parliament (Storting) alone, Høyre leader Erna Solberg wants to include the much smaller Christian Democrats (Kristelig Folkeparti, KrF) and the Liberals (Venstre) in the government. That will make it tougher to agree on a common platform, but may make it easier for Solberg to temper some of Frp’s more hard-line stands on, for example, use of oil revenues and limits on immigration. The consistently strong showing of the non-socialist parties, with even KrF attracting more voters in one recent poll, worries political commentators like editor Arne Strand of newspaper Dagsavisen, and not just because he’s leaned to the left for years. He lambasted all the party leaders this week for their failure to highlight any major issues or even to get an energetic campaign underway. 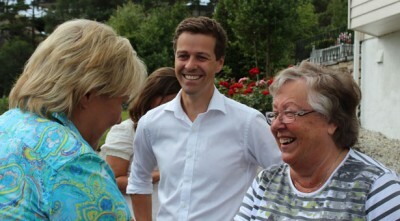 Solberg was the first, along with Knut Arild Hareide of KrF, to hit the campaign trail over the weekend, with Solberg inviting reporters along as she glad-handed voters in parts of her home territory on the west coast, but she stumbled as well: Høyre’s decision to front more flexible paternity leave for men in Norway as a campaign issue has backfired, with even some of Høyre’s main supporters fearing that removal of mandatory quotas on paternity leave will result in less men taking leave, and thus be a setback for equality in the workplace. It’s all led to a lack of enthusiasm for the election that Strand and other election researchers predict will result in low voter turnout. If everyone thinks the conservatives will win anyway, they may not bother to vote. The lack of enthusiasm may also be because Norwegians don’t have much to complain about. Even Høyre’s own website notes that “Norway is a good country to live in,” a subconscious admission, perhaps, that the last eight years of a Labour-led government hasn’t done much damage, but then adds “a lot could be better.” The sheer desire for a change at the top of Norwegian politics is more likely to have won Høyre the support it seems to have. Party officials from Labour and Høyre promised in various media reports this week to start knocking on doors and picking up the pace of the campaign. Labour’s party secretary Raymond Johansen flatly denies Labour has already given up the election and claims the party’s “election locomotive” can win lots of ground between now and the election on September 9. He opened Labour’s “campaign central” on Monday and soon all the parties’ stands will start popping up in cities around the country. 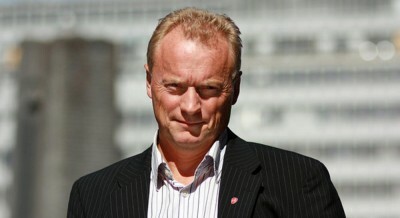 His counterpart for Høyre in Oslo, Nikolai Astrup, also claimed he and his party colleagues would knock on four times as many doors as they did during the last parliamentary campaign four years ago. “We’ll be out every single evening,” Astrup said.